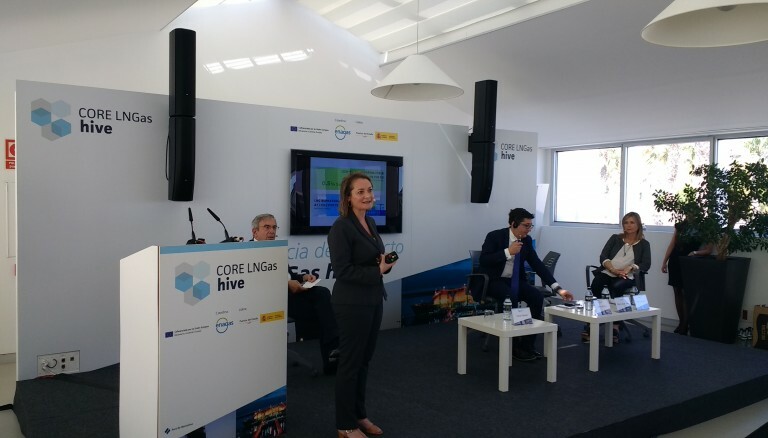 June 23, 2017.- Yesterday the GAINN4SHIP INNOVATION project was presented at the 1st Conference of the CORE LNGas hive project, held in Barcelona (Spain). The conference included presentations related to sustainability and maritime uses of LNG, perspective of the consumers and marketing companies; and about other European similar projects. In the last session, Mercedes de Juan, Technical Manager at Fundación Valenciaport, presented the progress of the European project GAINN4SHIP INNOVATION which is performing the world’s first ever retrofit of a high-speed ropax vessel, the Bencomo Express, to run on LNG. This ground-breaking initiative will demonstrate the feasibility of using LNG as a marine fuel, in addition to providing a more environmentally-friendly and sustainable connection between the Canary Islands.